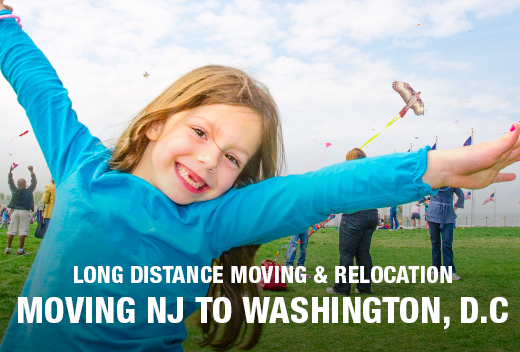 Long Distance Moving: NJ to Washington, D.C.
With its many government jobs, political internships and a strong economy, Washington, D.C. is truly a cosmopolitan city that attracts all types. Commonly referred to as "the District" or "DC," Washington, D.C. is the country's capital and boasts a number of popular sites, from the White House to the Lincoln Memorial. When you're not feeling patriotic or political, you can visit the Pandas at the National Zoo or enjoy Washington's great restaurants, entertainment, cultural events and shopping. Whether you're looking for an urban condo, suburban townhouse, or single family home, there's a neighborhood for everyone. With diverse neighborhoods, you can choose an area that best suits your budget and lifestyle. All Jersey Moving & Storage has decades of experience helping professionals, families and retirees moving to Washington, D.C. execute their moves on budget and on schedule. By specializing in a focussed area and using our skilled movers and equipment, we are able to provide superior moving services. When you hire the All Jersey Moving and Storage team to execute your Washington, D.C. to New Jersey or New Jersey to Washington, D.C. move, you can expect our movers, our trucks and our reputation. That’s why we are capable of handling your long distance move with the same attention, care, and expertise that our local moving customers have grown to expect. Moving New Jersey to Washington, D.C.
Buying a Home in Washington, D.C.